--Search ALL-- Versatile Displa. . . Designer Showroo. . . Floorcovering Di. . .
--Search ALL-- Display and Exhi. . . System 8000 Swin. . . Show-Pro™ Presen. . . Presentation Dis. . . System 3000 Swin. . . Poster Frames Tower Kiosk Disp. . . Framed Art & Mol. . . Book Displays Specialty Displa. 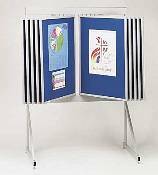 . .
Our loop fabric display panels allow you to post your materials using Velcro-like hook tab circles, hook tape or push pins. Clear Multiglas™ covers each side of the panel to protect items and keep your display looking its best. This Straight Line Floor Display features 10 two-sided panels, each measuring 24"W x 36"H. Straight Line display offers a 90-degree viewing angle. When ordering, use the pull-down menus above to specify your frame and panel color preferences. 10-Panel Loop Fabric Floor Display with Multiglas™ - 30" x 40"
10-Panel Loop Fabric Floor Display with Multiglas™ - 40" x 48"
20-Panel Loop Fabric Floor Display with Multiglas™ - 24" x 36"
20-Panel Loop Fabric Floor Display with Multiglas™ - 30" x 40"
20-Panel Loop Fabric Floor Display with Multiglas™ - 40" x 48"
* For faster shipment of Blue, Black or Silver Loop Fabric with Gray Frames, see In Stock items.